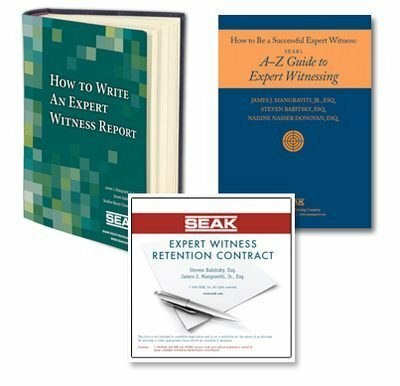 Expert Witness Resources - SEAK, Inc.
We work with experts of all specialties including accountants, engineers, physicians, accident reconstructionists, appraisers, construction, fingerprint, safety, security, financial, maritime, etc. We have trained many thousands of expert witnesses since 1990. Our clients include the FBI, IRS, SEC, FAA, Secret Service, NYPD and Department of Defense as well as Fortune 500 Companies, Boutique Consulting Firms and countless individual expert witnesses. We are the publisher of the SEAK National Directory of Expert Witnesses which is the #1 rated expert witness directory and guarantees referrals for experts placing their first listing. How Much Should an Expert Witness Charge? How to books, DVDs, live seminars, and seminars on DVD for Expert Witnesses. Personalized recommendations to make more money as an expert witness. Expert Witness preparation for key depositions, hearings and trial testimony. Learn how SEAK can help you develop a lucrative and sustainable expert witness practice. On-site Expert Witness training for corporations, associations and government agencies. Mentoring and training for those experts desiring the highest level of service. The #1 Expert Witness Directory Containing 2,000+ experts. Individual training to show you how to write top-notch reports.